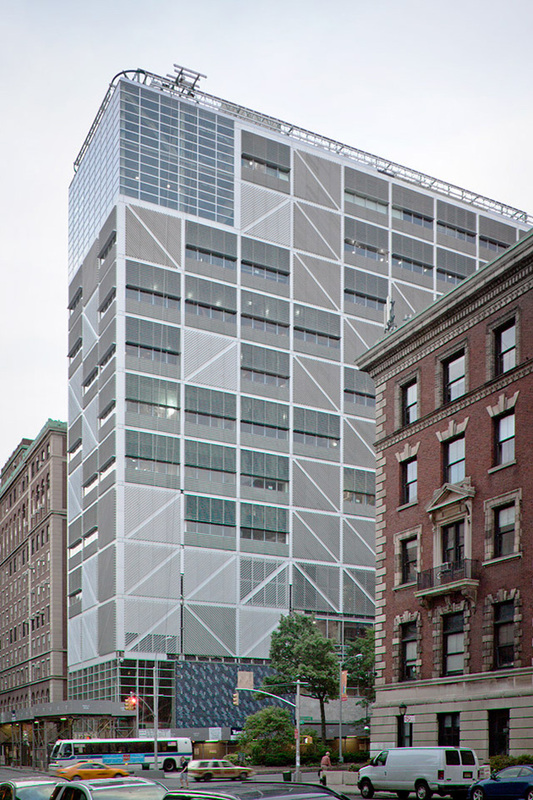 In the middle of the last decade, Spanish architect Rafael Moneo receive an order to build a new building that would broaden the flagship facility of Columbia University in New York City. 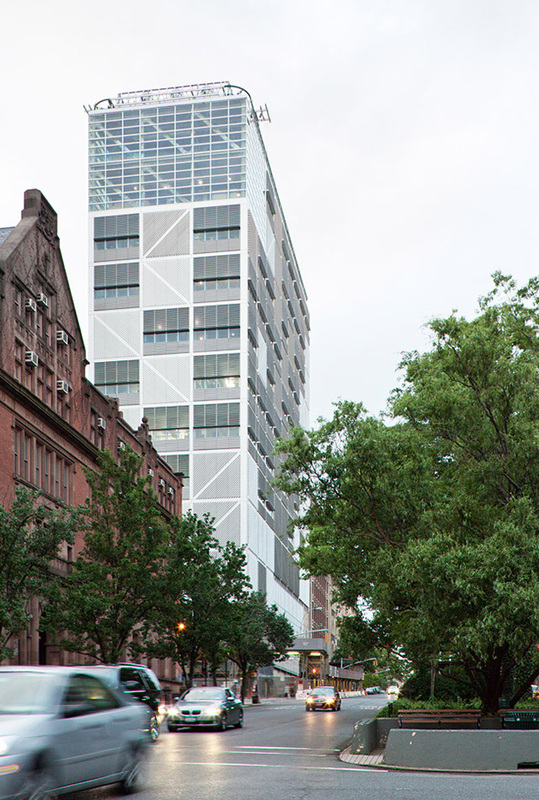 A professional challenge in dialogue with the Manhattan skyline from which to build a unique architectural work along Broadway Avenue. 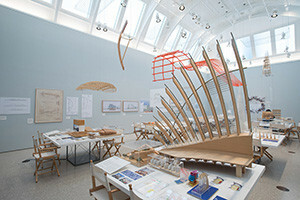 The attitude of Moneo projective analysis part usual boundary conditions in which to place the work to be performed. The recognition of the historical urban characteristics, the deep understanding of the demands that will arise and the assessment of architectural precedents tied to each location will offer the keys by which to guide in defining their own buildings. 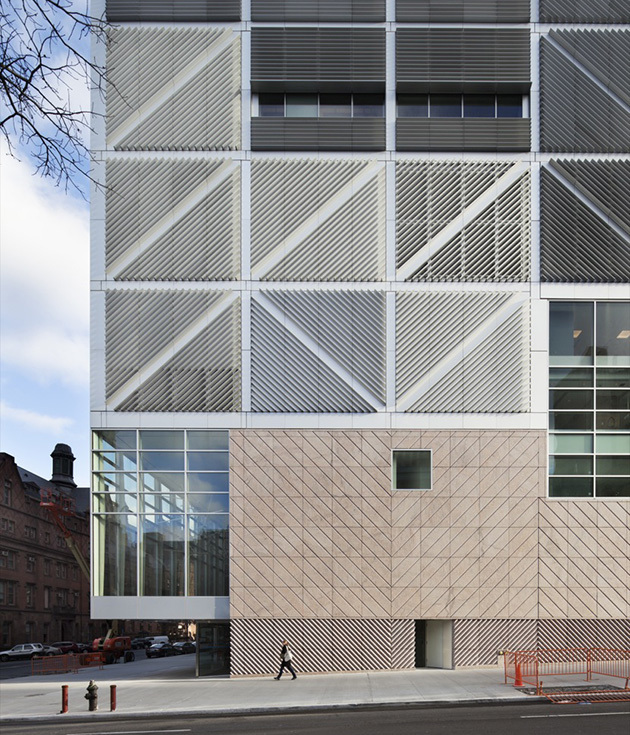 In this case, understanding generating patterns York campus was an essential key to the establishment of the building volume. 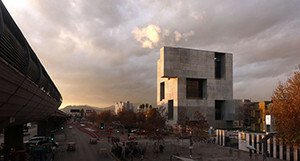 In Columbia, originally, urban design and architecture college was entrusted to the architects Yorkers, Charles McKim, William Mead y Stanford White. Some representatives of the City Beautiful movement that left an imprint inspirations extensive Beaux Arts architecture in the city of skyscrapers in the late nineteenth and early twentieth. 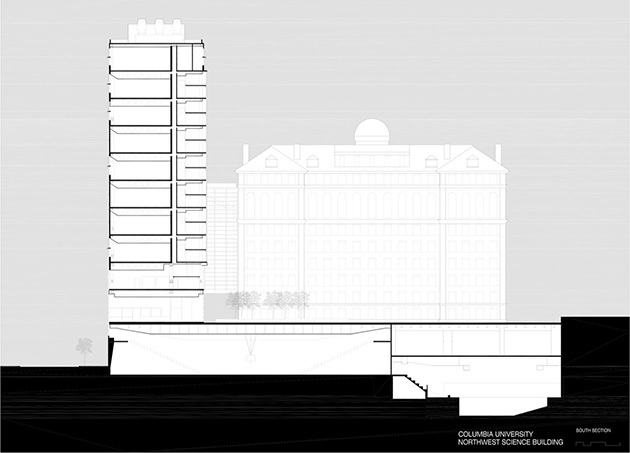 McKim, Mead & White set for the campus of Columbia University formal ordination plot follows the characteristic rectangular blocks is based on the occupation of the island on which stands the central metropolis that American. The specific location of this project was a corner of the campus that had been kept relatively empty of buildings. Years back, Britain's James Stirling contribute less fortunate projecting a precedent with which it was intended to finish this part of the campus. 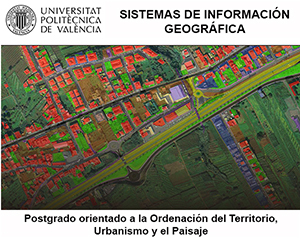 His concept unrealized holding open some pedestrian connection to the western part of the city, introducing new uses and spaces built. Stirling's building posed a great beam structure diagonal, for some unknown reason, could not be executed. 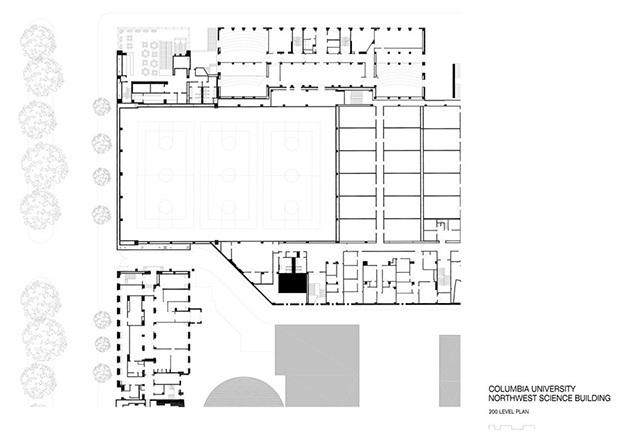 In the case of the new draft Moneo, was likewise, to solve a larger space needs occupying that corner the whole university; while, to achieve preserve and facilitate communication between the city and central areas of the campus. Another element that also conditioned to this new project was the requirement to maintain the existing gym in the middle of the plot. The maintenance of the ratio and measures classicist buildings adjoining is symptomatic of how to proceed the architect Navarre. 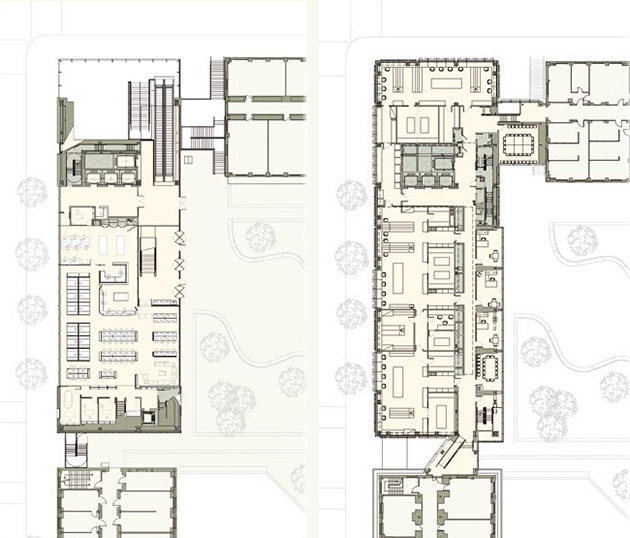 The new laboratory units, library and ancillary spaces are set to plant the size of the corridor defined by its heavy neighboring buildings. The approach of respect for neighboring buildings just a polite way of specifying the way their access and functional spaces are connected. Because of this, The new building provides communication volumes and walkways that are delayed alignments Street respective paths offering slots that establish a clear transition. 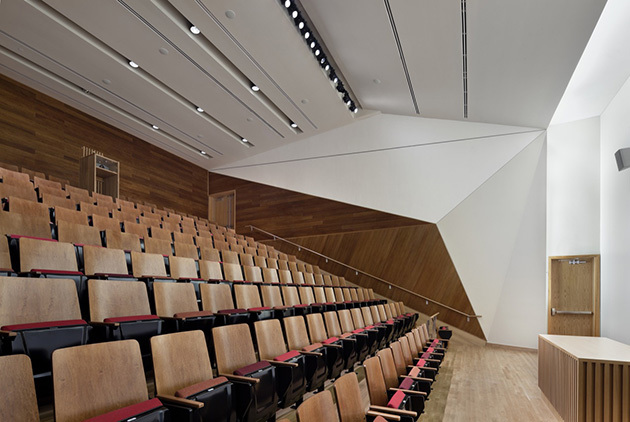 On the other hand, considering the problem of bridging the gap of Francis S. Levien Gymnasium without touching, the new building is required to focus the project's main compositional effort from the definition of its general sections. The reasons for this jump than forming the new laboratory as a bridge building come, so it seems, of strict seismic city ordinances requiring clear separation between the two structures. 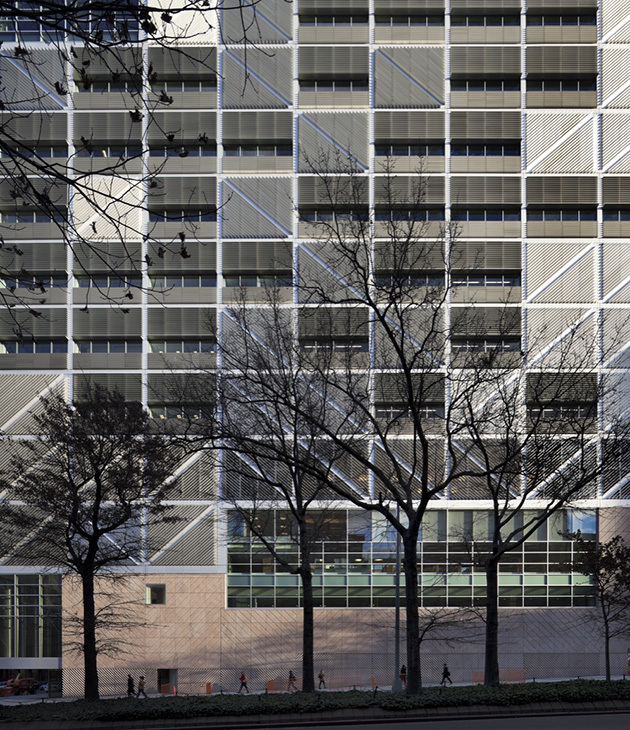 From a stylistic point of view, strict fourteen storey rectangular prism could also interpret it as a formal reminder to the Lever House, that content skyscrapers Gordon Bunshaft executed in 1952. The Lever House is a representative office building that has become a major highlight of Park Avenue, opposite the Seagram Building by Mies van der Rohe. This tribute to that other great architect of the city would again another indication of how to address encyclopedic projects habitually exercises Rafael Moneo. 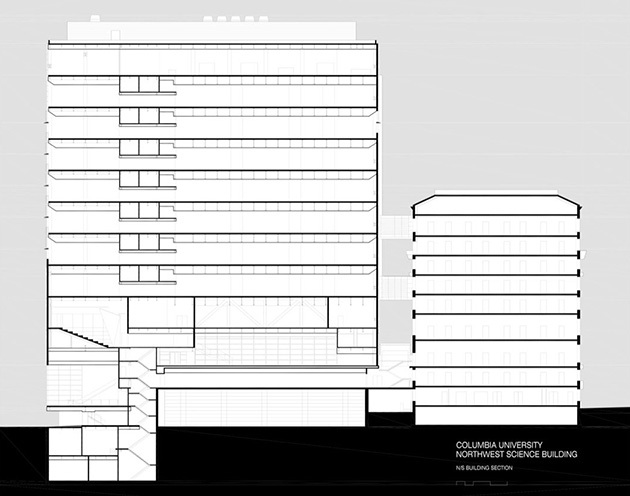 In this sense, the outer skin of the Columbia Science Laboratory is indebted to the ideas of Gottfried Semper who, in his seminal work Die Vier Elemente der Baukunst (The four elements of the art of building) of 1851, architectural differentiation advocated four essential components, the basement, home, and membrane structure. Here, while the base tends to dissolution, both unique membrane structure and overlapping are particularly relevant. Thus, is known that the building establishes a kind of disappearance of the meeting; in the linker with the ground. 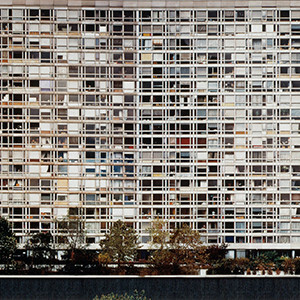 Something like if the mass of the building outright floating about where it sits. A formal ploy clearly relates it to modern traditions that established the great masters of the twentieth century in some emblematic buildings. It is from where Moneo structure arises dump the expressiveness of the forces acting on this building flying bridge above the existing university gym space. While, large share of the burden resting on a large central pillars on which are inscribed the vertical communication cores, orthogonal on a metal frame placed outside the diagonals just and necessary to balance the shear stresses resulting from external volumes flight. All this symphony of forces acting wants to express directly and in a transparent manner; and therefore, has a formal reflection on the management of holes and Façades. 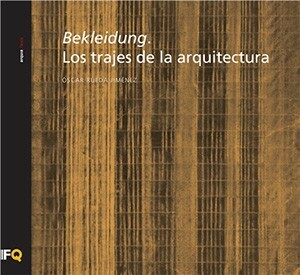 So, the composition of the cladding of the facades (el "bekleidung" semperiano) follows a regular pattern caused by the structural frame which supports the building. 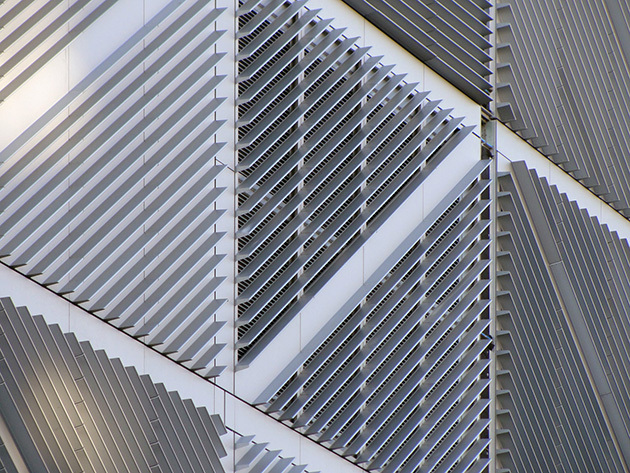 Hacia Broadway, closes the building using aluminum panels diagonally hatched in those enclosures where voltages are expressed cantilevers. The rest, the cladding hollow rectangular horizontal inserts allow foreign contemplation from laboratory spaces, double height. 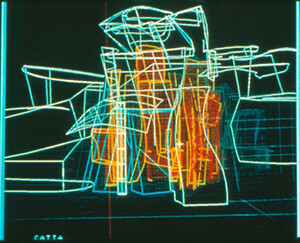 To formalize this game almost textile, the architect comes to inspiration offered by the minimalist Frank Stella painting. Their regular frames provide an example of composition with which articular façades patterned by the diagonals of the necessary structural braces. Moneo is a follower of the great artists of the mid-twentieth century and is often homenajearles using explicit forms for some architectural. As, for example, Kursaal in San Sebastián in which the definition of your basement walls are a reminder of some parts such as Walking and Marking of 1991 de Richard Long, the artist known British Land Art. 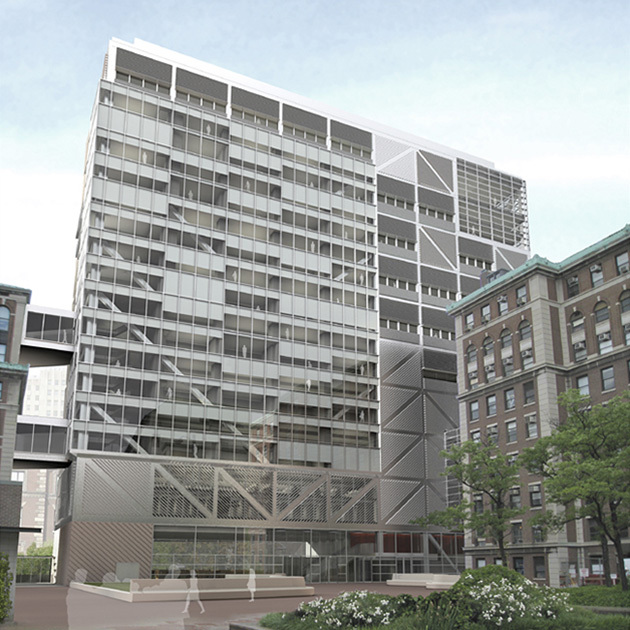 In the rear facade, office space and services are fully opened a conventional curtain wall allowing biased view of the landscaped areas and inside buildings, located in the center of campus. 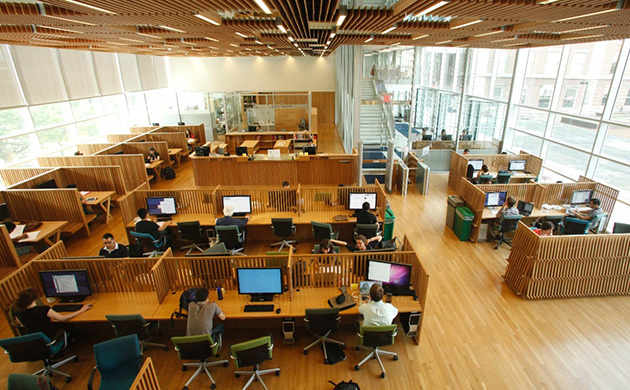 Especially, into the auditorium of the School of Business and the dome of the main building, el Low Memorial Library Building. For treatment of the interiors more accessible and utilities such as, library, cafeteria, etc.. resort to specific spatial designs. 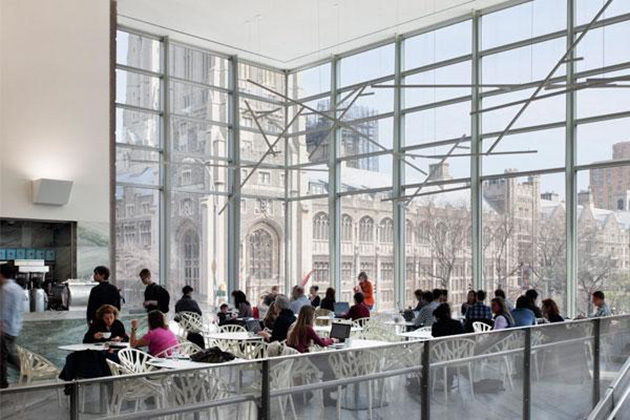 In the library, large glazed side openings allow easy visual accompaniment distant prospects through the gardens of the campus and the city. At the same time, users can be inserted into a network of cages woodworking; which together with the furniture offers a treatment reserved, in line with studio work. The false ceiling of the same material just there a geometry engineered form of great warmth. 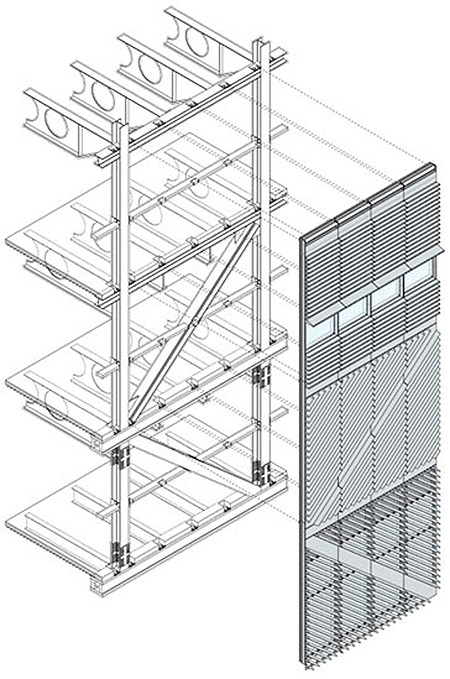 Access ladders and communication with the campus courtyard introduce the visitor and user both to the large double-height café and the central area at a higher altitude. This complex relationship is off and open space visually projected on the slit city allowing general access. The cafe is due to it as a lamp that is perceived as claim in the corner of Broadway and street 120 West. 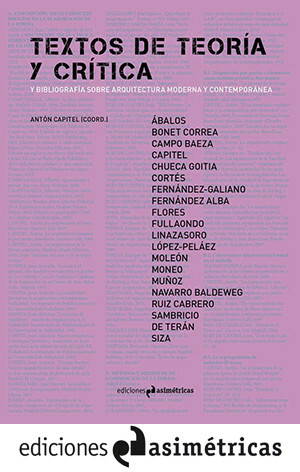 From all the above we can conclude considering that this project is another example of the great masters who have Rafael Moneo to addressing and solving complex problems. All, without losing the elegance formal constructive and give it a long experience of many successful works.